Hi, I actually can't find detailed information about your band on your website or your biography. Could you please mention about your band? 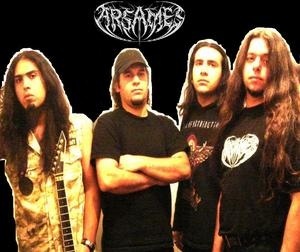 ARSAMES (arsames.net) is an Ancient death metal band from Iran. Formed in 2002 by band leader and skin pounder Ali Madarshahi. I listened a song called 'Gates of Persia' on your myspace profile. I wonder about the lyrics of that song. Do you mention about the legendary Persian history or is that just like an intro? We write all the lyrics about our legendary history! You know the first Empire of the world is Persia! the first instructor of human rights is Cyrus the great so we have a strong culture that we should talk about it It's an intro for the track Cyrus the great and wanted to show the fear of the enemies of Persia. I think the bands' name is also related whit this?